What do you get for the person that has everything? How do you impress someone in this glitzy, technological age? What gift is so personal it allows people to stamp their name on the internet, but is so easy to give it’s just a phonecall away? A SwitchWorks Vanity Domain, that’s what! Vanity Domains from SwitchWorks are just $45 for one year, and come with one email address. No matter what the holiday or occasion, you can find a SwitchWorks’ Vanity Domain that is perfect. Christmas? Why not give your mother Mom@XmasWish.ca (We checked! It’s available!)? Birthday? Who else will give Alicia@bestsweet16.com (available as well!)? Graduation? Nothing says how proud you are like Donald@College-Grad.com (Yep! Still up for grabs!) 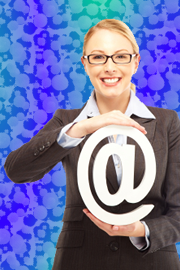 Why not use a Vanity Domain to make your presence known when sending emails to your friends and family? Why be the generic jimmy@hotmail.com, when you can be James@SuperJimmy.me? Call 416-531-8750 for more information about Vanity Domains or you can order online!